An American abroad might feel might lonely at this time of year. Luckily, Toronto is a city that embraces outsiders’ traditions and even likes to join in on cross-cultural celebrations out of solidarity a pure unadulterated love for turkey feasts. Here’s where to double down on Thanksgiving dinner in Toronto by celebrating American Thanksgiving on Thursday, November 24. Served Thursday, November 24 through ’til Sunday, November 27, this roast turkey dinner with all the trimmings is capped off with apple walnut crumble for dessert and is priced at just $23. Celebrate Thanksgiving like they do in the south with a day full of NFL, turkey, trivia and prizes, starting at noon at this pub in The Beach(es). American Thanksgiving at this restaurant in Cabbagetown starts at 5 pm on Thursday, November 24. The three-course feast priced at $24.99 comes complete with butternut squash soup and biscuits, roasted turkey with sage-apple-onion stuffing, gravy, cranberry sauce, garlic mashed potatoes, veggies and pumpkin pie. This pub on the Danforth hosts its 30th annual American Thanksgiving dinner on Thursday, November 24. Priced at $48.50 per person, or $70 with wine pairings, the menu opens with options like pumpkin soup, and corn cakes, turkey or ham with all the fixings, and pumpkin butterscotch pie for dessert. Want to celebrate at home? Get the complete meal packed to go for $40 per person. Also on The Danforth, this bistro is serving a three-course American Thanksgiving prix-fixe menu for $39. The roast turkey dinner here comes with pomme puree, Red Fife stuffing, brussel sprouts, cranberry relish and sage jus. $12.95 for a turkey entree is reason enough to celebrate Thanksgiving twice even if you’re not a duel citizen. Double up on the festive meal for cheap this year by visiting this Village-area pub on Thursday, November 24. NFL football on from 12:30 pm onwards, cheap tall cans and a $9 Thanksgiving turkey sandwich are all part of the festivities happening on Thursday, November 24 at this Scarborough sports bar. 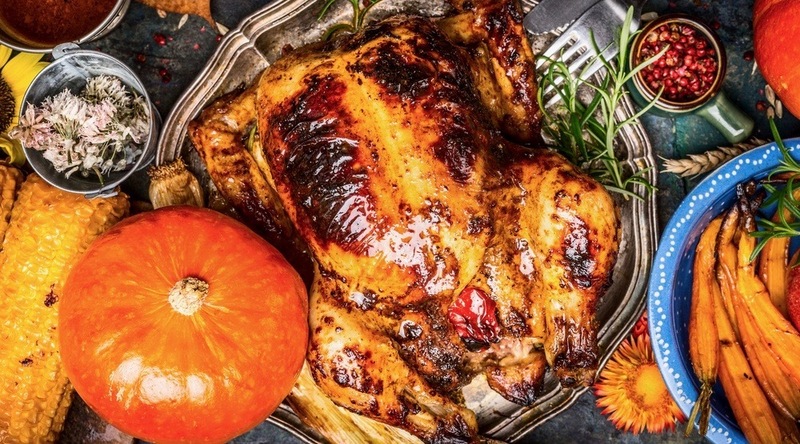 Want to do Thanksgiving at home but without the fuss? This festive specialist is a spin-off from L-eat Catering caters complete turkey dinners year-round. Dinner for 10-14 people starts at $325 and can be ready for pick-up with just three days notice.